I caught the fever from Joan as you know and thought I’d share with you how I made my cross/plus/what have you blocks. There are many variations depending on your plans, hopes and dreams. 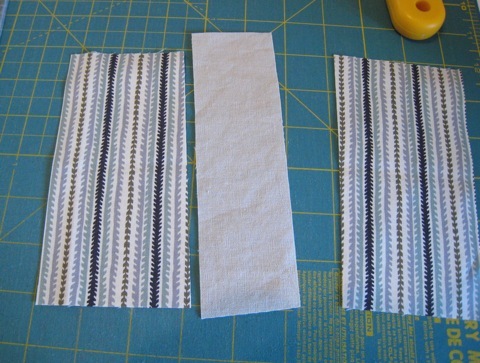 If you need several blocks from the same fabric, maybe Tia’s directions are for you. 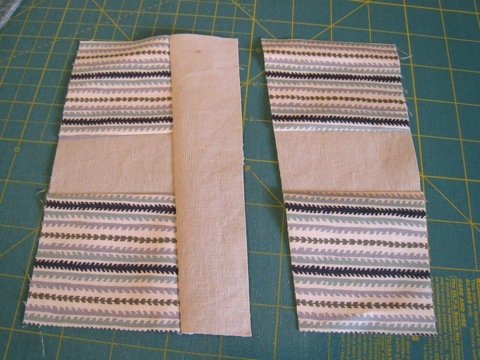 If you want to cut your crosses and “backgrounds” from the same fabrics, maybe Carla’s liberated cross blocks are for you. 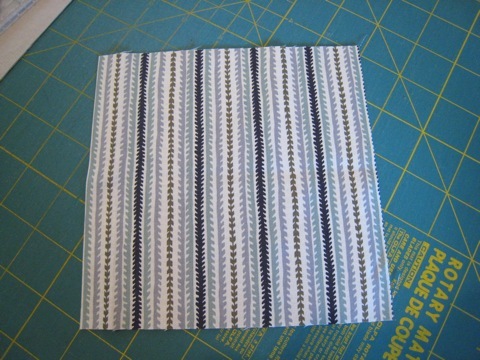 Kelly McCaleb also offers a pattern PDF on Etsy that is lovely and is another variation. Her sample quilt is sumptuous! I had a specific need to conserve my Hope Valley fat quarters. 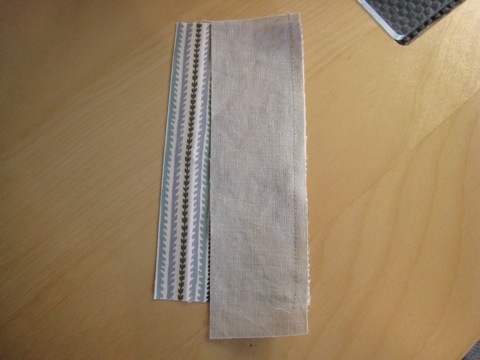 And a desire to use some lovely Essex linen (in sand) acquired from Jackie. 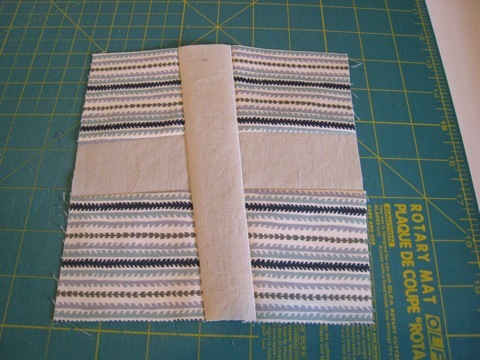 To make the most of my 18″ x 21″, I decided to cut approximate 6″ squares from my fat quarters. Three was the magic number. 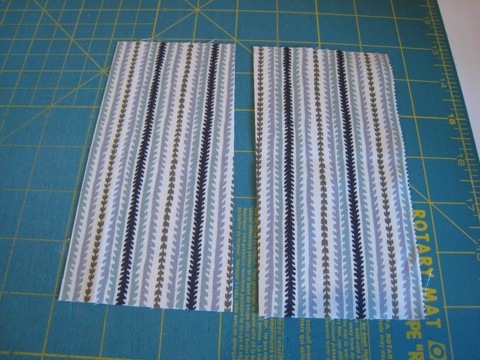 I also though, wanted to make some matching blocks with the Hope Valley fabric as the cross part, so I cut two strips approximately 2″ wide x 18″. That’s it! 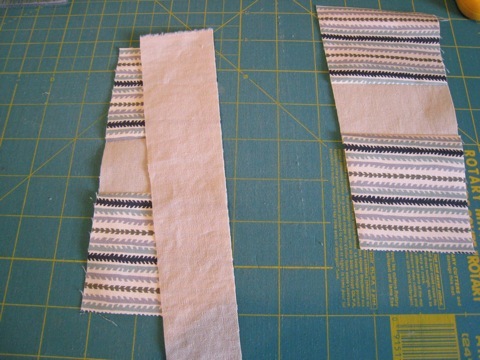 That’s all I’m willing to part with of these fat quarters for this project. I also had to kind of squeeze to get three 6″ blocks. Some of the blocks are more like 5 7/8″, but I figured I could work with that. 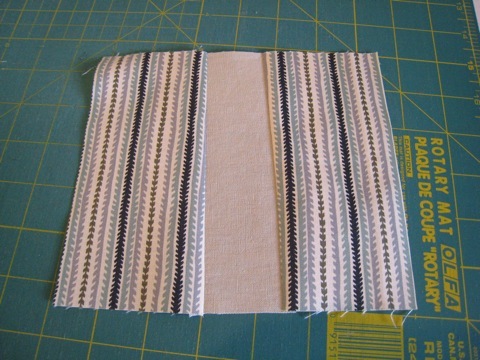 Press (out, open, your preference) and trim the strip even the “background” fabric before adding the other half of the block. Again, slightly angled or off center is fine. 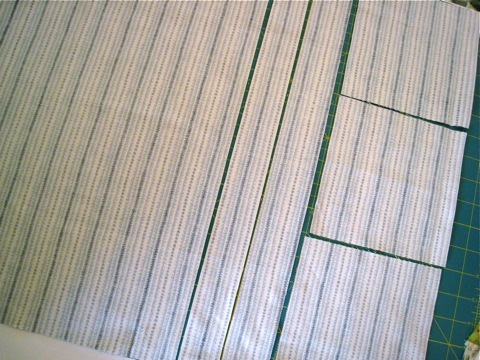 Depending on the width of strips you’ve inserted, you will have some flexibility in the “wonkiness” of your squaring up. Go crazy! Fun, fast, easy! And, I will confirm, addictive. EDITED TO ADD: Nearly forgot that I wanted to mention Karen Griska’s Asterisks quilt in the May/June 2010 Quiltmaker mag. LOVE IT! Which then leads me to mention Busy Bee’s Victory Garden quilt pattern. I’ve been saving this one quietly for a while because I LURV it so much. I had to put it away because I start squealing every time I see it. Neat, neat! 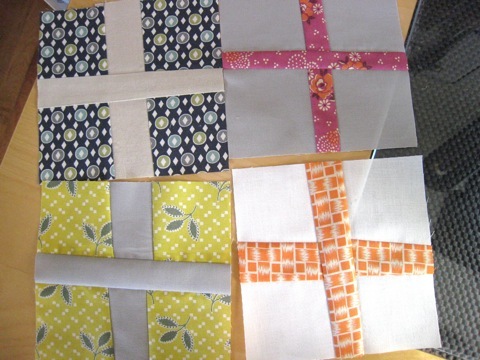 I’ve seen LOTS of cross quilts all over Flickr —- thank you for the show-how of using the concept with fat quarters. I have an abundance of those! Can’t wait to try these! Thanks for the tutorial! 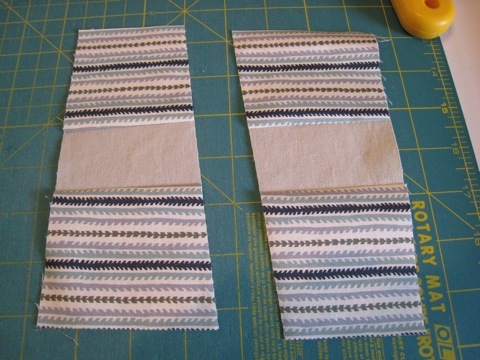 Like Valerie, I have a lot of fat quarters I just had to have, now I have something to do with them. Thank you. Thanks for a great tutorial. 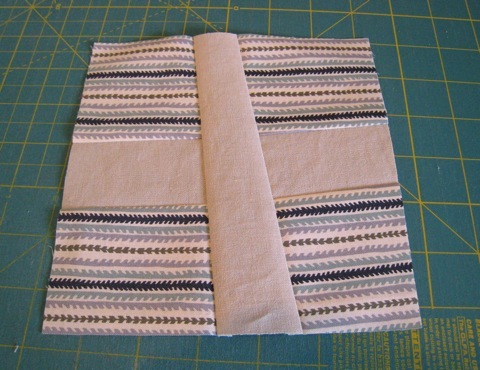 I am making a collaborative quilt using cross blocks and linked to your tutorial. I hope that’s ok. Thank you for this tutorial! 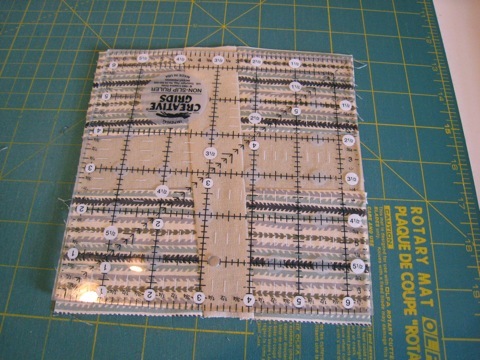 All the other wonky cross block tutorials I’ve seen have been for such large blocks – 12″. 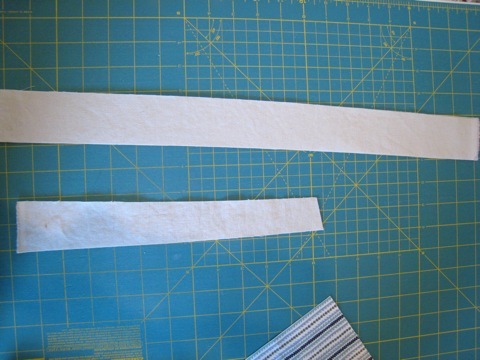 I’m using Chicopee and, like you with Hope Valley, I’m reluctant to use large cuts.